India is a key strategic partner of the US with the war against terror and stability of the Indian Ocean Region in focus, US Secretary of State John Kerry said on Wednesday as he interacted with students at the premier Indian Institute of Technology here.Kerry, who reached Delhi on Monday evening, faced Delhi's rain woes for the second time, as his motorcade had to negotiate a waterlogged road right in front of the institute.He, however, chose to joke about it and asked the audience in the almost packed IIT hall if they had come by boats. "I don't know if you came in boats or amphibious vehicles of some kind," Kerry asked, provoking laughter.His programme to visit a few holy places in the national capital was, meanwhile, cancelled even as the American Embassy preferred to say it was "postponed" because of the torrential rain. In a lighter vein again, Kerry also said that the Computer Science programme at the IIT was so competitive that those rejected here were taken by institutes like MIT.At the same time, he chose the platform to send out a strong message to China asking it to abide by an international tribunal's decision on claims to some reefs and atolls in the South China Sea, citing India as an example. "India's decision to accept an international tribunal's judgement over its maritime border with Bangladesh actually stands apart from other choices made by other countries," Kerry said. "It is a model how a potentially dangerous dispute can be resolved peacefully, including the South China Sea where the US continues to call on China and the Philippines to abide by the tribunal's recent decision which is final and legally binding on both parties," Kerry added. Beijing has rejected the decision by The Hague-based Permanent Court of Arbitration over strategic reefs and atolls in the South China Sea. The judgment was in favour of the Philippines.He also mentioned Pakistan and stressed it needs to work more against the terror network there. "I have had many conversations with the Pakistan President, Prime Minister, particularly Prime Minister (Nawaz Sharif), about how to focus on sanctuaries in the western part of the country, how to deal with the Haqqani network, deal with Lashkar-e-Taiba," Kerry said. "It is clear that Pakistan has work to do in order to push harder against its indigenous groups that are engaged in extremist terrorist activities...."And it must work with us to help clear sanctuaries that are affecting relationship between Pakistan and India and also our ability to achieve peace and stability in Afghanistan," said Kerry.He emphasised that India has a larger role in resolving global conflicts. "Rising India will play a very critical role in resolving global challenges," Kerry said adding that the challenges included extremism, terrorism, extreme poverty, uneven and unsustainable growth, among others.In his around 40-minute-long speech, which was followed by a 30-minute-long question-and-answer session, Kerry also welcomed the passage of the bill on Goods and Services Tax and bankruptcy law in Parliament.Touching upon the issue of climate change, Kerry emphasised that India is the only country which is going to increase the use of coal instead of decreasing it, though he added that the Indian government is making efforts to change this. 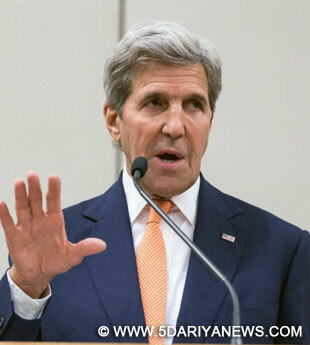 "The choices we make in our energy policy will decide whether our planet survives or not," Kerry said.He pointed out how the last decade has been the hottest, the previous one the second hottest and so on.